Parents Day is coming up. It’s always the fourth Sunday of July, and this year, that’s the 29th. Have you ever observed this unique holiday? There’s a chance you’ve never heard of it. While it was created in 1994 by President Clinton, it’s not as well-known as many other days of observance. It’s not even marked on a lot of calendars, so many people don’t know about it. It’s not just another day to give gifts to mom and dad. Instead, it’s a day to reaffirm your love for your family and for both parents and children to acknowledge their love and commitment to each other. It’s not always easy to be a parent or to take responsibility for raising a child, and those who do this day-in and day-out should be honored for it. Parents’ Day was set aside to be that one day out of the year that all family members stopped and re-dedicated themselves to the family unit. This includes nontraditional parents, single parents, adoptive parents, and even those who aren’t strictly mom or dad, such as an aunt, uncle, grandparent, or family friend who has become like a second mom/dad. Everyone who has helped raise a child deserves to be honored and recognized on Parents’ Day. 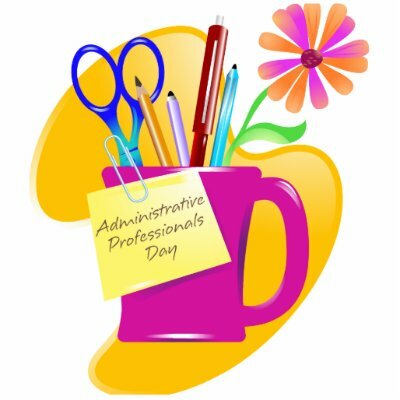 What exactly do you do on Parents’ Day? Anything you like, really. You can have a family dinner at home or at a restaurant, go on a family outing, take a short weekend vacation, or just sit at home and talk about some of the great times you’ve had. Just be together and let the love you have for your family show. Want to send your parents some lovely flowers for Parents’ Day? We have many flower arrangements in Fort Worth, TX, that are perfect! TCU Florist’s Holly Callahan recently completed the class entitled Wedding Wow: Bouquets with Style hosted by Teleflora at its state of the art Education Center in Oklahoma City, Okla. Floral Designers from all over North America attended the seminar to learn the latest trends and techniques in flowers for brides, attendants, and flowers to wear. Holly participated in four days of intensive hands-on design sessions, matsering the latest shapes and forms of bouquets. 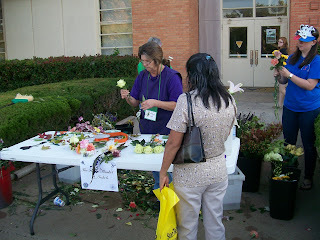 The class also learned about how to care for premium flowers used in wedding work and how to make tham last longer. Taught by successful retail florist, Susan Ayala AIFD PFCI of Loma Linda, CA, the class focused on creating coordinated designs for brides to carry and flowers to wear. Students were challenged to complete a series of projects during class. Holly received a certificate of completion from the Teleflora Education Center, now in its 27th year of providing advanced floral education, in recognition of the advancements made during this intense hands-on design class. Father’s Day is almost here. It’s this Sunday, the 17th of June. What do you have planned for your dad in Fort Worth, TX? The city has a lot to offer! Here are just a few things you could do. If you don’t want to go out, you can host Father’s Day at your house. While this means you’ll have to do some cleaning and cooking, it does give your family more time to visit, and it’s more relaxed. You can have your siblings bring dishes, or you can cook out if the weather’s nice. Being at home means you can let the kids out to play in the yard, and you’re free to snack on things all afternoon. You can even play games or watch dad’s favorite movie. • Go to the Fort Worth Zoo! Of course, don’t forget a cool gift for dad. While he might not want a dozen roses, we’ve got some great Father’s Day flower ideas in Fort Worth, TX. This year TCU Florist hosted its first ever Posh Prom Party. An invitation went out to South Hills High School junior/senior students during their prom fashion show. We made a lot of preparations for the big day. We made sure we had every corsage bracelet and boutonniere holder our wholesalers could get their hands on. We also ordered lots of diamonds, rhinestones, pearls, feathers and beads. The students began showing up right at 2:00 and most hung around until the party ended at 4:00. They had no idea there were so many choices and cool things you could do with corsages. Our three models enjoyed getting their hair all fixed up at Goldwaves Hair Salon, dressing in their prom dresses and modeling the newest floral accessory trends. A few girls were really excited about the Peacock feathers and arm bands. 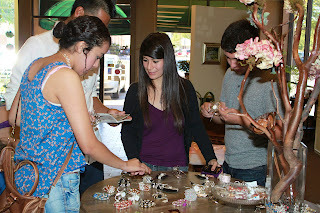 Others loved the diamond bracelets and the idea of wearing them long after prom. The guys seemed to be very interested in the food and refreshment buffet!!! Everyone here really enjoyed putting this event on and the students seemed very appreciative. We hope that we can do many more of these parties for our high school community. 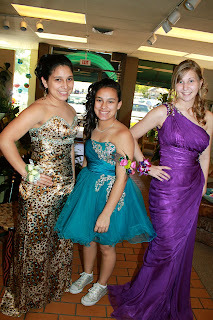 If you would like to book a private prom party, please contact us. It’s FREE! We provide the food and can even schedule a consultant to help with hair and make up selections. We looking forward to hearing from you! There are a number of different fun events you can do in the spring, but before you can really have a fun time, you’ve got to make the transition from winter to spring. What all does this entail? Mostly it means it’s time for some spring cleaning! Here are a few different chores you might want to do so you can get the work out of the way and have a fun spring. 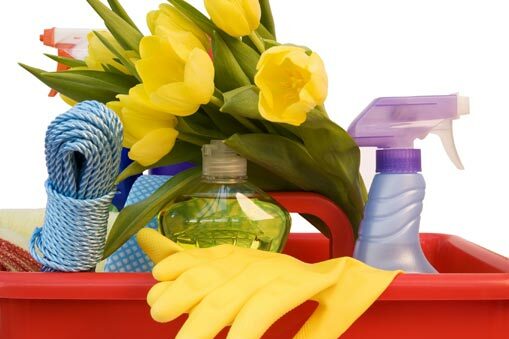 While it’s not everyone’s favorite activity, spring cleaning needs to be done. The first step in the process is to put away all of your winter decorations, blankets and clothes to make room for your spring items. There’s no need to have a heavy blanket on your bed, for example. You also want to make your home look more spring-like: put up your bright, cheery decorations in place of the snowmen and other winter items. For those who love clothes, it’s time to get out those great spring outfits that look so good on you! You can box up the scarves and heavy sweaters for another year. Did you find some spring clothing you didn’t wear last year or the year before? Donate these gently used items to a local charity. Do the same with any winter clothes that don’t fit quite right anymore. Plus, you can use this as an excuse to go buy a new outfit or two. If you’ve got the time, give your whole house this treatment. If you haven’t used an item in over a year and can’t truly see yourself using it within a year, get rid of it. Get rid of anything that seems like it’s just taking up space. You’ll feel better after purging all these unnecessary items from your life. Of course, some things get a pass, such as family heirlooms and one-of-a-kind items. Once you’ve done the inside, it’s time to do the outside. Following the winter months, homes usually need a few minor repairs. The gutters may be full of gunk, you might need to do a little painting, and your flowerbeds will need to be cleaned out. Finally, to make your winter to summer transition complete, you need a bright bouquet of spring flowers! We can take care of that! Order your spring flowers in Houston, Texas, today! 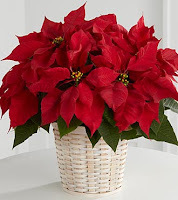 Are Poinsettia Plants Really Poisonous To Children & Pets??? How often have you heard Poinsettias are deadly poisonous and claim the lives of children and pets every year? I hear this often when my customers are interested in purchasing a plant as a Christmas gift. Usually they say – What do you have besides poinsettias? My friend has pets (or children). This is a myth that has been so wide spread for decades that even some florists believe it to be true. Luckily for us and our pets, it’s not true. The origin of the myth dates back to 1919 when a 2 year old child of a US Army officer stationed in Hawaii passed away suddenly. It was believed that the child ingested poinsettia leaves. The American Society of Florists has looked into the matter extensively and says there was never any proof that poinsettia leaves were responsible for the child’s death and has been determined hearsay. Since that non poinsettia death in 1919, there haven’t been any real ones either. And no wonder, it would take a 50 lb child to ingest over 1.25 lbs of poinsettia bracts (500-600 leave) to exceed the experimental dose according to POISINDEX information services. (POISINDEX is the primary resource used by most poison control centers.) If a child or pet were to try to ingest the leaves they may end up with a tummy ache, mainly because they are ingesting something foreign into their digestive system. Though this is highly unlikely, as the taste is described as horrible. Now that you know the truth, don’t be afraid to fill your home with these beautiful Christmas plants! For the last three years, our long time designer Marianne has donated her time and flowers for South Hills Elementary School and South Hills Christian Church’s Fall Festival. 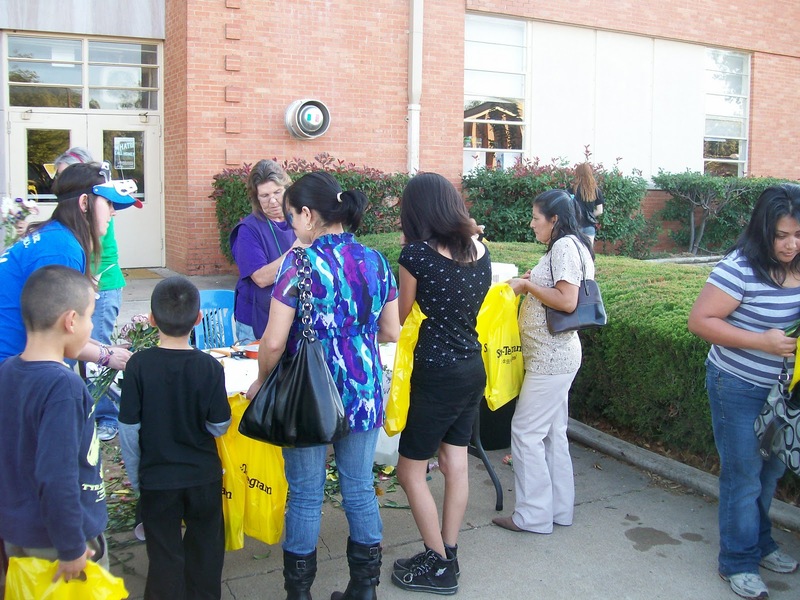 The yearly festival raises money for the school’s PTA as well as for the church. Children and families enjoy the food, bounce house, games and the book walk. Each year Marianne brings buckets and buckets of fresh flowers to the event and creates hand-tied bouquets. Each bouquet is unique with roses, poms, lilies, orchids and more. Everyone loves watching how they are made! Many people like to take them home, but a few enjoy giving them away. One young boy bought five bouquets and said he was giving them to each of his girlfriends! Marianne always has a great time at the festival and looks forward to it each year.